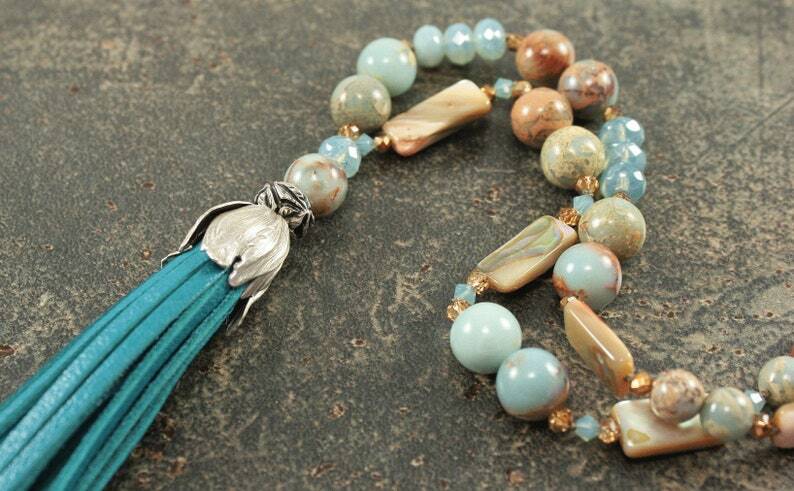 This one of a kind necklace features a turquoise leather tassel pendant framed by a necklace knotted with semi-precious aqua terra stones in shades of rust, peach, turquoise and off white, along with turquoise Czech glass beads, sparkling turquoise Swarovski crystals, beautiful shell beads in off white and rust, and bronze crystals. The necklace is finished with a sterling silver toggle clasp. The necklace is 31 inches long. The pendant adds another 6 inches to the length.